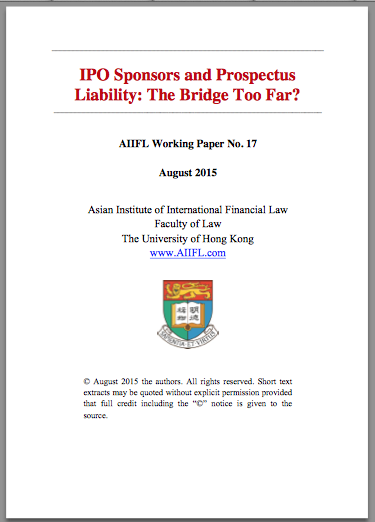 "HK IPO sponsors could escape the prospectus noose"
As Hong Kong IPOs start to make a timid comeback after a long summer lull, I unearthed an interesting working paper entitled “IPO sponsors and prospectus liability: the bridge too far?”, published in August by the Asian Institute of International Financial Law (AIIFL) of the University of Hong Kong. Its authors, Syren Johnstone (in the interest of full disclosure, co-author with me of the study manual for IPO sponsor examinations published by the Hong Kong Securities and Investment Institute), Antonio da Roza and Nigel Davis (who runs a course at HKU where I teach as a honorary lecturer), are all members of the university’s faculty of law. They argue at some length that, contrary to the conclusions reached by the Securities and Futures Commission (SFC) in August 2014, there appear to be no clear legal grounds supporting the SFC’s view that sponsors are subject to statutory civil and criminal liabilities in respect of material mis-statements made in Hong Kong IPO prospectuses. "Criminal liability is as serious as it gets, but the SFC's two-page conclusion falls well short of explaining to sponsors on what basis they should fear criminal penalties" said the authors, in an interview with Clawback. Their findings could prove to be ground-breaking, and help to topple the SFC’s position. In such a case, it would then be up to the courts to determine the responsibility of sponsors on a case by case basis, a much more palatable outcome for brokers and investment banks accused of having been involved in sponsoring work of sub-standard quality... Click here to read the full article. Click here to download the IPO report from the AIIFL website.